10% Off exclusively for BBG Members! Established in 1992, our primary aim is to provide quality travel services to business and leisure travelers alike. Supported by strong financial management, impressive customer satisfaction and constant improvement, Al Arabi Travel Agency has grown into a highly respected Travel Agency in the region. We are committed to providing a professional service to all our clients, ensuring they benefit from our experience, unique style and energy. Al Arabi Travel is delighted to offer the BBG Members this “not to be missed” exclusive Cruise discount. *10% off exclusive offer for BBG Members. To view the special discount code please log in using your member credentials here. Then select Member Offers from the Membership drop down. 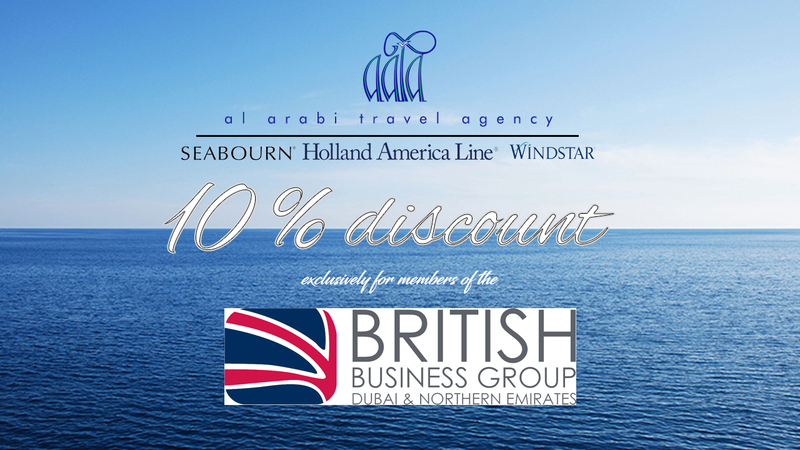 For all enquiries, please email leisure@alarabitravel.ae or call 04 343 3929, and quote the discount promo code.